You might not like the Wild Card, and you might not like the World Series extending into November, and you might promise you will not like this expanded version of the playoffs Bud Selig is hinting at. But your displeasure will be nothing compared to the most ill-fated of all of baseball’s post-season formats: The Temple Cup. On the other hand, as of this blog post, you finally have some photographs of action from The Temple Cup. The Temple Cup was an attempt to make the best of a monopoly. 19th Century Baseball is largely and arrogantly ignored by even the game’s historians, but nearly everything we have today was either established or contemplated then. 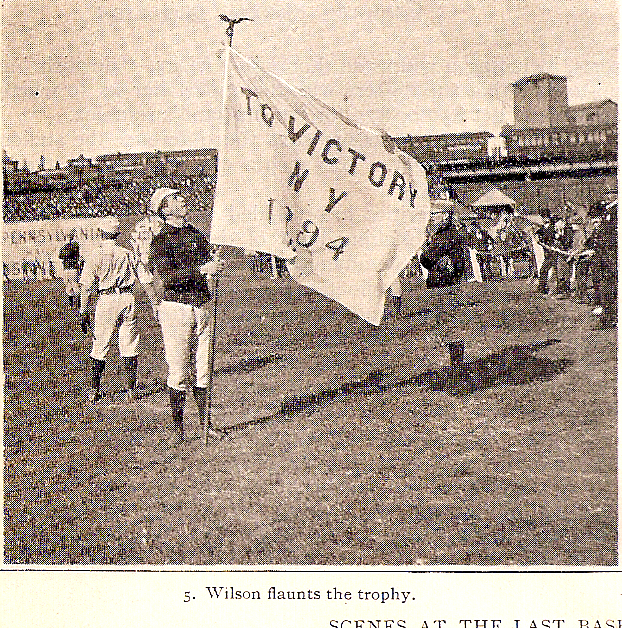 The two-league system was up on its feet by 1882 and the World Series (literally called “The World’s Championship Series”) was established by 1886 (and a championship trophy, “The Dauvray Cup,” was established a year later). There was also a powerful players’ union by 1890 which would have overtaken the game’s power structure had it not been betrayed by the businessmen with which it necessarily had to partner to form its own player-run league that season. The 1890 season destroyed the still solidifying rivalry between the National League and the American Association. Most of the players of the established leagues jumped to the union-backed Players League, and even in a time of franchise fluidity and player relocation, it was too much confusion and too much betrayed loyalty and simply too much baseball for the fans to stand. The NL, AA, and probably the PL lost money, and the balance of power was so deranged that the Brooklyn Bridegrooms, who as American Association Champions had lost the 1889 World Series to the NL Champion New York Giants, themselves jumped to the NL in 1890. They won the league crown, while the AA’s Louisville Cyclones – virtually untouched by the player raids because their players were thought to be so bad – went from worst to first in the Association. 5,600 Kentucky fans showed up to see Game One of that natural Brooklyn-Louisville rivalry on display in the 1890 World Series. But the crowd for the next game was half that. By the first game in Brooklyn just 1,050 showed up. As the weather and baseball both worsened, Game Six drew just 600, Game Seven only 300. And even though the Series was tied at three games apiece with one draw, the teams called the thing off – it was that bad. The Players League went out of business that winter, and as its talent returned home the American Association and National League squabbled (that’s why the Pirates are called the Pirates; they grabbed second baseman Lou Bierbauer when the Philadelphia Athletics failed to put in a claim for him). Within a year the weaker AA was dead, and all that was left was the NL, with four of the stronger AA franchises tacked on. The twelve-team, no-division league was so unwieldy that seven of the teams finished at least 32 games out of first. All of which brings us back to the Temple Cup. The National League monopoly had to come up with something to fill the void of the World Series, which had died with the two-league system when the American Association folded. 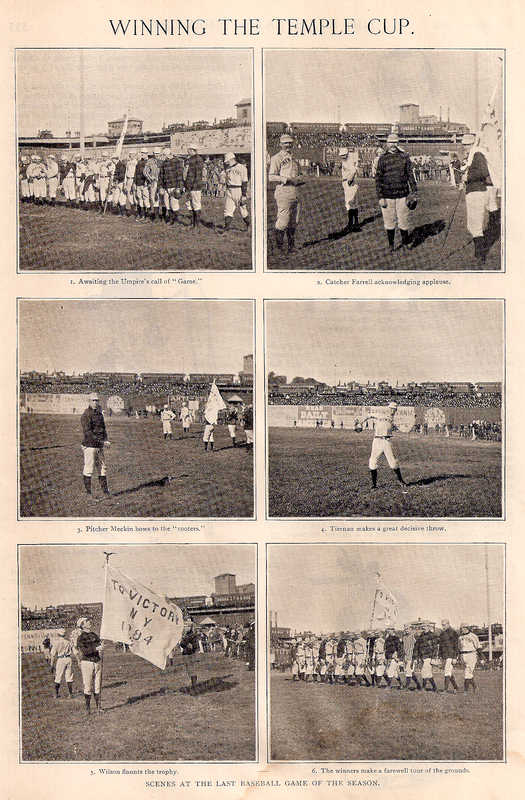 In 1892 they tried a split season, matching the first-half winners from Boston against the second-half victors from Cleveland. It was just as dull a prospect as it would be when the owners returned to it 99 years later after the Strike of 1981, and it was abandoned. 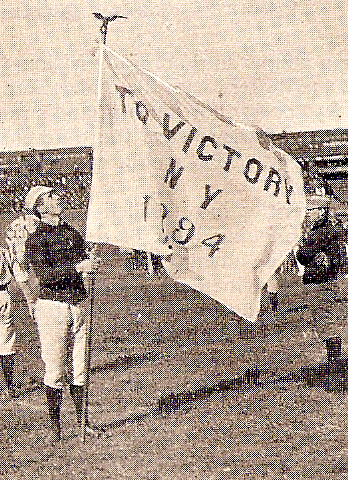 There was no post-season play at all in 1893, and that didn’t work either. That’s the exiting owner of the Pittsburgh Pirates, Chase Temple (in a neat tie-in, one of the owners who signed away Lou Bierbauer from the A’s) offered a 30-inch tall, $800 trophy to the winners of some kind of post-season championship (a team would only get it if it won three seasons in a row). But what kind of post-season championship? Naturally, the first-place finisher versus the runner-up. 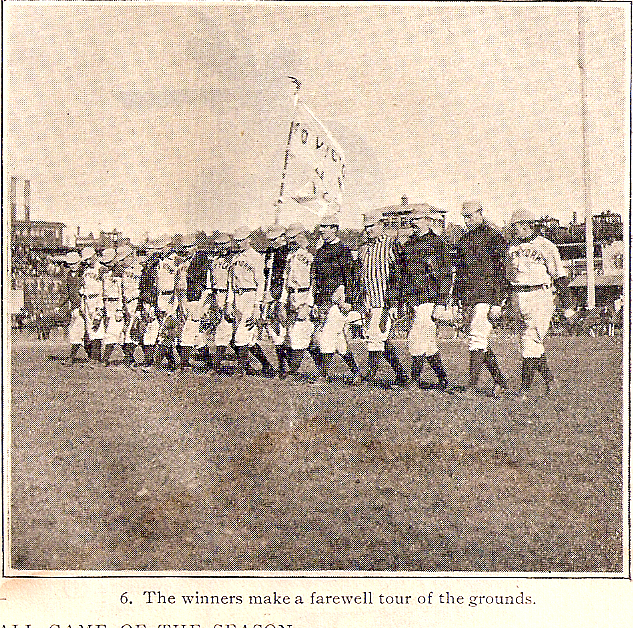 The team that won the pennant would play the team that finished second in a best-of-seven series. If the first-place team declined to play, the second-place and third-place teams would compete. If the second-place team declined to play, the pennant winner would play the third-place team. If the…well, you get the idea. I do not think it coincidental that until last week I had never before seen a photograph from any of the only four Temple Cups that were played before the idea was abandoned in the winter of 1897. Only once did the Regular Season Champs seem to take it seriously. None of the Series went longer than five games. Gate receipts for the first Cup, in 1894, were supposed to be split 65/35 but the members of the pennant winning Baltimore Orioles and runner-up New York Giants secretly agreed to go halfies on the money. How could that possibly go wrong? And finally we get to the point of this post. I’m not saying these are the first photographs ever discovered of The Temple Cup. I’m just saying these are the first I’ve ever seen, and that there are none in the Noah’s Ark that is the Hall of Fame Photo Archive. Behold! The late highlights, just 116 years after the fact! This is from a weekly magazine called “The Illustrated American” which was published from 1887 or so until, apparently, the day headquarters in Brooklyn burned down in 1898. There is no accompanying article, and as you can see from the scans, the photographic/printing process is understandably crude (it’s 1894!). They called them “halftone photo-mechanicals” and reproducing them usually creates that herringbone effect. Still, they are extraordinary (and possibly unique) looks into what might have become baseball’s equivalent of the Stanley Cup. Let’s look at the shots one at a time and discover that the publishers fudged, more than once. with the big glove is catcher Duke Farrell, and, to his left, in the other sweater, is Game Four starting pitcher Jouett Meekin. At the far right of the picture, seemingly just ambling up to the line, is no less a figure than Hall of Famer John Montgomery Ward. 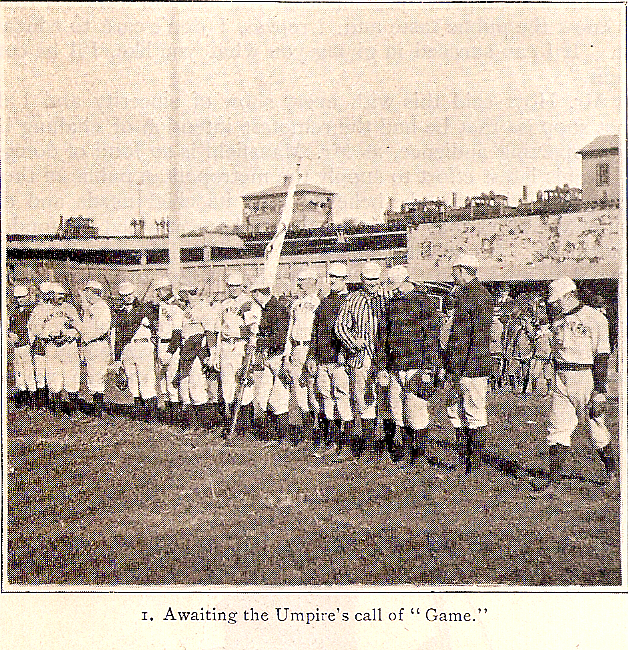 Ward is not only the Giants’ second baseman and manager, but the organizer of that first players’ union that precipitated the end of the game as they knew it and made the Temple Cup necessary. 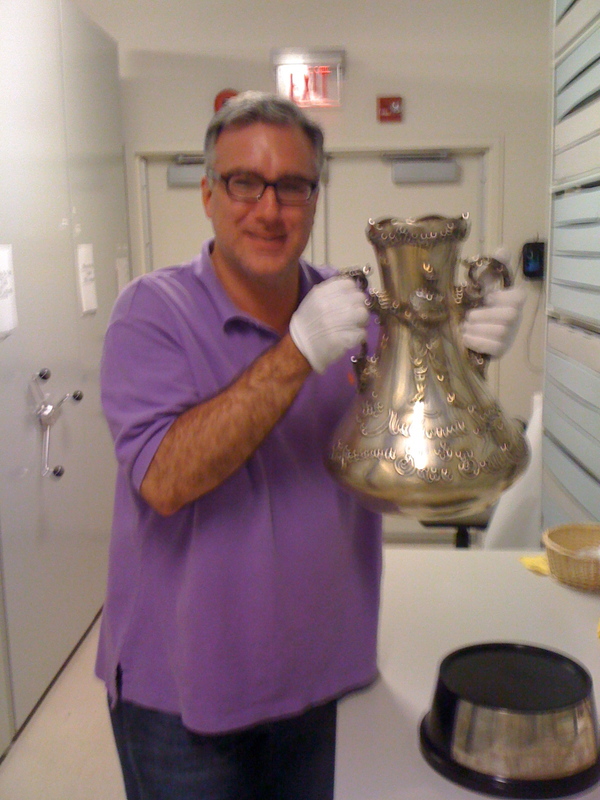 As Ward begat the Players League and Chase Temple offered up The Temple Cup, Mrs. John Ward had a hand in this, too. As the actress Helen Dauvray, she had been such a fan that the Dauvray Cup for the Winners of the World’s Championship Series from 1887 through 1890 – manufactured by Tiffany’s – had been her idea. Between Meekin and Ward, if you think you see a horse, I don’t think you’re wrong. Keep reading. And those are three small engines perched outside the stadium. The 8th Avenue Elevated Line not only ran directly from downtown Manhattan to the Polo Grounds on 155th Street, but the precursor to the city’s subway system had a storage yard behind leftfield. The yards would still be there in the 1940’s, and the “El Train” until the Giants moved to San Francisco in 1958. I’m thinking Duke Farrell is actually acknowledging the photographer shouting at him. And he wasn’t the only one. That’s Van Haltren again at the far left, in his quilted pants (useful both for sliding and for warmth – it is October 8, 1894, after all). A little further back is, I believe, left fielder Eddie Burke. 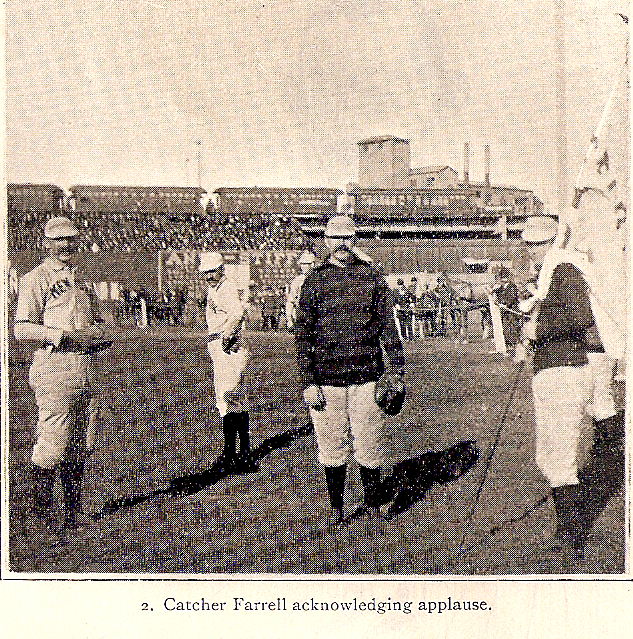 Farrell would later become the first coach for the Yankees (1909). At the far right, still holding his flag, is backup receiver Parke Wilson. And there’s the El Train in the background, along with the confirmation of the horse. This was not necessarily some precursor to the Phillies’ on-field mounted police brigade during the 9th Inning of their World Series win in 1980; for a small fee, season ticket holders could park their Broughams and other horse-drawn affairs in the outfield. But he took quite a few bows that season. After three mediocre years with Louisville and Washington (29-51), Meekin flourished in his first season in New York (33-9, 41 complete games, and this while striking out 137 and walking 176 in his 418 innings of work). 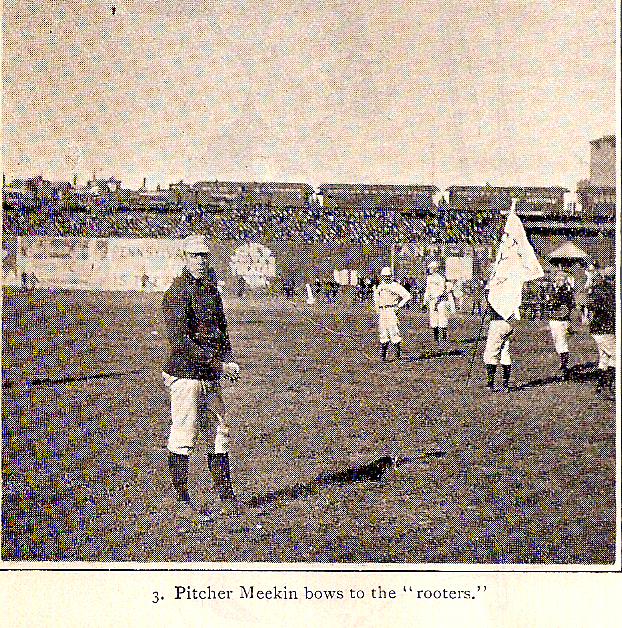 Meekin was one of the new generation of fireballers who had been the impetus for the last great change in baseball just a year earlier – when the pitcher was moved back from a “box” fifty feet from the plate, to a mound located sixty feet, six inches away (his teammate Rusie, who won 36 games that year, and a fellow in Cleveland named Denton “Cyrus” or “Cyclone” or just plain “Cy” Young were the others). 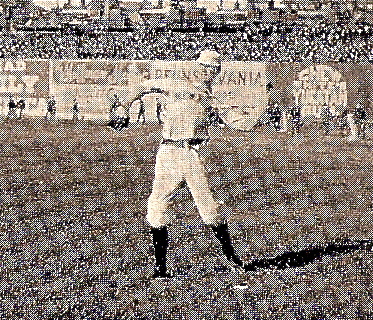 Relying on a side-arm delivery and absolutely no curveball, Jouett would twice again win 20 games, then get flipped to Boston in the middle of the 1899 pennant race in a controversial and some say smelly move by the Giants to try to secure Boston the crown. Though he’d give up two in the first to the Orioles today, he finished up with a five-hit victory, his second of the Series. Also the game ended 16-3 New York, and the boxscore tells us none of the Giants’ outfielders got an assist that day. Tiernan also contributed only one hit and one putout to the New York cause (our friends Farrell, Meekin, and Van Haltren had three each). But Tiernan is surely worth being singled out by the photographer. In the days when almost no ballplayer lasted, Tiernan roamed that corner of the Polo Grounds for twelve and a half years until an injury abruptly ended his career in July of 1899. He had 1,838 career hits, batted .311 and slugged .462, stole 449 bases, and in that deadball era, he not only hit 105 homers but five times managed double digits in single seasons. And considering he was one of just 24 players to get 5,000 At Bats in National League play before 1900, I think he should be in the Hall of Fame. Note, by the way, the ads behind “Silent Mike”: for the newspaper “The New York American,” The Pennsylvania Railroad, and “White’s Yucatan Gum.” In a time-travel short story by the late Jack Finney, the hero arrives in a just-slightly altered New York of 1962 where the top-selling auto brand is the Stutz, there was a President Coopernagel, the Giants never moved to San Francisco, and the most popular gum is…Yucatan. Obviously it isn’t. The other Giants are still warming up behind the pennant and the shadows are all the same as in the “pre-game” shots. 18 hits and 16 runs by the Giants and they sweep the Temple Cup and you missed getting a single shot of the entire game? 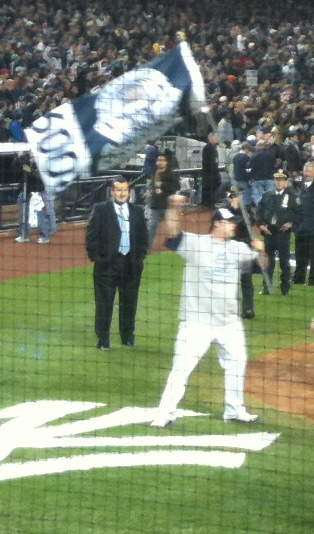 I’m not even convinced that’s Parke Murphy holding the flag. Looks more like the pitcher, Meekin. And there is that same horse, just to the right of the flag. During the seventh inning, two horses escaped from the grasp of their owners behind the ropes in center field, delaying the game several minutes before they were caught. And today, we get worked up about a loose squirrel on the field. Of course, they would have had to have taken their farewell tour before the game. Okay, I’ll stop being so picky. These are photos of the long-forgotten Temple Cup, and its long-forgotten winners, the ’94 Giants. Some of the player ID’s are clear now: the thin guy just to the left of flag-bearer Parke Wilson appears to be Mike Tiernan. On the other side, with the ‘stache, is George Van Haltren. Not sure who’s next, but the four furthest right are Amos Rusie (I believe), Duke Farrell, Jouett Meekin, and – his stride here confirms it – Johnny Ward. Somewhere in that group is one more Hall of Famer, Giants’ third baseman George Stacey Davis. It’s too bad the Orioles didn’t wander over to the “Illustrated American” photographer. John McGraw was the third baseman on that team, and among his teammates, Dan Brouthers, Hughie Jennings, Wee Willie Keeler, Joe Kelley and Wilbert Robinson all went to Cooperstown (as did non-playing manager Ned Hanlon). In fact, if you’d attended Game Three the day before, you would have seen exactly 18 Orioles and Giants on the field, and with Rusie pitching for New York, fully half of them were to be Hall of Famers. Of course, with these photos – you sort of did go to that game, didn’t you? 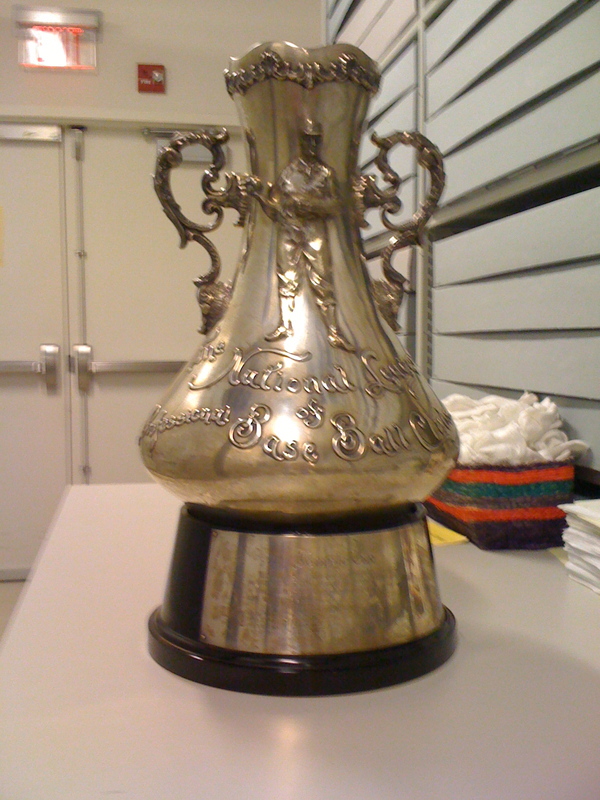 …the Temple Cup. Complete with guy who broke it (not really – it’s supposed to do that). And if you think anything has really changed from the baseball of 1894 and the Temple Cup, consider a detail from one of the magazine photos, with a detail of a shot I took after Game Six of the 2009 World Series, which took place literally the other side of the Harlem River, no more than a thousand yards from Game Four of the 1894 Temple Cup. Mr. Jouett Meekin on the left; Mr. Joba Chamberlain on the right.